Managed Service Provider (MSP) Annual Report 2019 – Navigating Through Uncharted Territories: Is the Industry Compass-Ready? 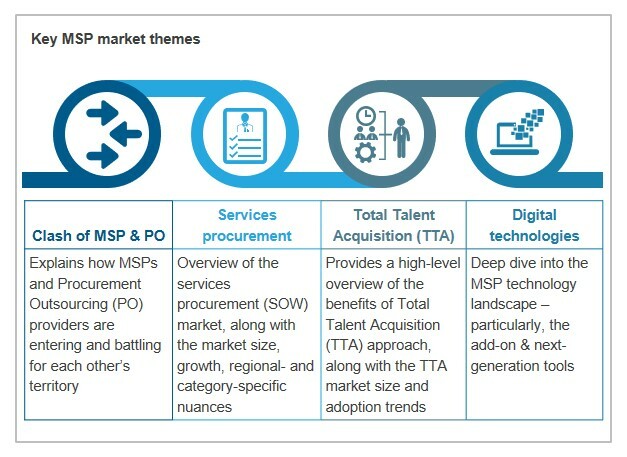 The global Managed Service Provider (MSP) market is growing steadily on the back of rising demand for contingent workforce across geographies and industries. It is expected to witness a growth rate of 10-12% in 2018, backed by ever-increasing demand for temporary workers, rise in adoption of services procurement, and the emergence of the gig economy, resulting in rapidly-increasing numbers of freelancers/ICs. MSP markets across regions demonstrated a strong growth, particularly in the emerging markets of Europe, Middle East & Africa (EMEA) and Asia Pacific. The following service providers have been analysed as a part of this report: AgileOne, Allegis Global Solutions, AMN Healthcare, Brainnet, Broadleaf Results, Capita Resourcing, Cross Country Healthcare, Fircroft, Geometric Results, Inc., Guidant Global, Hays, HCMWorks, KellyOCG, ManpowerGroup Solutions TAPFIN, Pontoon, PRO Unlimited, Randstad Sourceright, Volt Consulting Group, Yoh, and ZeroChaos.